First coffee fermented, and more has arrived! After processing our first coffee at the beneficio last night, we barely had time to grab a couple hours of sleep before getting back to it this morning. There was coffee to be processed, and Pastor Bernardo had another 2,000 lb of coffee cherries that he picked today! We started at 6 am by checking on the coffee that we depulped last evening. It was looking great, but needed the rest of the day to finish fermenting. With a new coffee coming this evening, it was no time to relax and reflect—there was much work to be done! We started by moving all of the coffee pulp into the vermiculture, where it will start composting into organic fertilizer. We then refilled our upper water tank with water for today’s processing, washed all of the tanks, adjusted the depulping machine, and it was time to go again! Pastor Bernardo arrived at 4 pm, and we were ready. We checked each sack of coffee cherries for quality and began loading it for processing. The coffee he brought us yesterday was done fermenting at 4:10 pm. Over fermenting coffee by even 30 minutes can damage its quality, so we washed it, sent it through the correteo to sort it, and moved it back into the tank to soak overnight. (Sorry, no pictures here—it was all hands on deck to ensure that this coffee was washed at the same time as we received and depulped the coffee that Pastor brought us today). Things went more smoothly today, and we were finished depulping shortly after dark. We will be back out by sunrise tomorrow morning to move Pastor Bernardo’s first coffee from soaking tanks into solar dryers, prepare to wash the coffee he brought us today, move coffee pulp, and continue making adjustments to the beneficio. As always, check back soon for more updates—coffee will be going into solar dryers tomorrow! The first coffee is at the beneficio! The first coffee is here! We are excited to say that Pastor Bernardo Ponce from Las Peñas brought the first coffee down from his field today, and we started processing it at the beneficio! It was a busy day as we ran tests on the water system, mounted and calibrated the depulping machine, and made sure that everything was in tip-top shape for the first coffee to arrive; we finished the last tweaks just 30 minutes before Pastor Bernardo pulled up in a pickup truck with 2,000 lb of coffee cherries. After months and months of planning, building, and preparing, it was a truly special moment to see the joy on Pastor Bernardo’s face as he helped unload his coffee and the pride with which he showed us his coffee. And what a coffee it is! It qualified for a picking bonus, meaning it was an exceptionally well prepared coffee. We finished unloading and weighing his coffee just before nightfall, and continued depulping well into the darkness. After depulping finished, we filled the fermenting tank with water. The coffee will ferment here for the next day before moving onto the next step of processing—washing, soaking, and sorting in the recently finished correteo. In the morning, we will load the leftover pulp (or coffee fruit) into the vermiculture where we will start the process of turning it into the first organic fertilizer produced at the beneficio. There is plenty of work to do from here—more solar dryers to be built, adjustments to be made to the water system, and more coffees to process. After we have a few hours to recover from the day’s work, we will be back to check on the progress of Pastor Bernardo’s coffee before sunrise tomorrow. Check back soon to follow the two week progression as we continue processing this coffee and prepare for more! Thank you to everybody that has supported us, especially the good people of Calvary CRC in Holland, MI, as we worked with the farmers of La Unión to turn the dream of a high-quality processing center into a reality. Construction continues well at the beneficio! We are in the final stages before being able to start processing. We finished installing the shelves on the first solar dryer, which means it is ready to start drying coffee. The correteo is almost completed, we just need to smooth walls, lay the floor, and add another faucet before it can be used to sort coffee. This should be done in the next three days! We also painted all of the tanks white. We started with two coats of sealant, which will prevent the tanks from absorbing dirt or water which could negatively affect quality, and then we finished the tanks with a latex paint. Much more than aesthetic work, this will provide three important functions. First, and most importantly, this will help us to keep the most important parts of the beneficio extremely clean. Much as critical areas in hospitals are kept white to ensure cleanliness, the white paint will help us see any dirt as we clean these areas daily. Second, the sealant will prevent the tanks from absorbing dirt or other contaminants. And third, this will help to protect these areas from sun or rain damage. There are only four steps left before we are able to start processing. We are connecting the water system and performing flow tests as I write this update, the correteo is being finalized, and we will be installing the depulper as soon as the water system has been tested. The water treatment system only needs tubes to be connected over the next few days. Check back soon to read more as we finalize these and get ready to start processing coffee! Once coffee is fermented and washed, it must be dried from 46% humidity down to 11%, at which point it is stable to be stored for long period of time. If this drying doesn’t begin within hours of washing, the high humidity levels can cause the coffee to develop off flavors and ruin it. At the beneficio, we will be using solar dryers for this drying process. When people hear the words “solar dryers” they often think of solar panels, moving parts, or engines; however, solar dryers use the sun’s energy in a much more direct way. 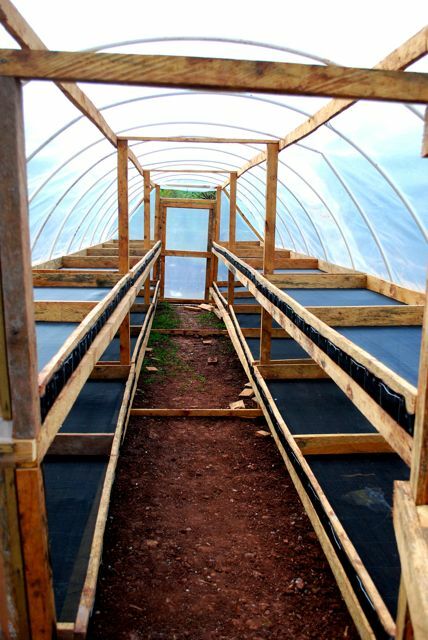 Solar dryers look much like small greenhouses, with shelves inside of them to dry coffee. They provide protection from wind and rain, while concentrating the sun’s energy into a force to dry the coffee. Other than solar dryers, there are two main forms of coffee dryers. The highest volume form is mechanical dryers, which load approximately 22,000 lb of coffee into an elevator system and heat coffee by burning wood or coffee shells. The other is patio drying, in which coffee is spread into thin layers on a cement patio. There are two reasons that we are using solar dryers instead of these other two options: quality and environmental sustainability. We are configuring our solar dryers to dry coffee in 7-10 days, as opposed to the 4-6 days of patios or the 24 hours of mechanical dryers. High temperatures created by contact with hot cement or passing near the flames of mechanical dryers are damaging to the structure of the coffee bean, lowering the quality. Additionally, coffee is never placed on the ground using our solar dryers. Patios, which must be used for a short amount of time even when mechanically drying coffee, are frequent hosts to trucks, children, dogs, chickens, pigs, and anything else that may be in the area. Finally, there is no way to bring coffee that is on a patio under shelter quickly in the case of a rain storm, and rewetting coffee even slightly can completely ruin the quality. Mechanical dryers cause great physical stress on the coffee—not only because of high temperatures but also because of the large impacts that happen as the coffee falls almost 40 feet from the top of the dryer to the bottom. Our second reason for using solar dryers is that they are an important part of making an environmentally sustainable beneficio. Drying patios require extremely large amounts of space and, therefore, a very large amount of cement. Due to the large area necessary, drying patios also represent a reduction in arable land. By installing solar dryers, we are keeping the land surrounding the beneficio available to grow off-harvest plants (from new coffee seedlings to nitrogen fixing beans to hardwood trees to plant in farms). Mechanical dryers, on the other hand take up a relatively small amount of space but require large amounts of energy input. First, they require electrical energy to consistently move the 22,000 lb of coffee inside them. Second, they require large fires to create the temperatures necessary to dry coffee. This requires the use of wood, causing deforestation; or coffee shells, which could otherwise be used to make organic fertilizers; and the burning of either of these produces carbon dioxide which is then released into the atmosphere. Once built, solar dryers require no input other than one person to move coffees every 30 minutes. We installed our first of four solar dryers in a joint training session with IHCAFE, UMF clients, and members of the COCAQUIL Coffee Cooperative. The other three will be installed in coming weeks as we prepare to ramp up processing at the beneficio. So there you have it—solar dryers.